The prettiest small town on the eastern Connecticut Shoreline, Stonington stands in stark contrast to the glittering casinos that rise in its hinterland. As you drive into the delightful village of Stonington, 5 miles east of Mystic along US 1 and US 1A and just across Little Narrgansett Bay from Watch Hill RI, you'll cross a bridge over the railroad tracks, turn left, and proceed south on Water Street, the town's main street (map). Plan to spend an hour or two wandering around Stonington on foot. Many visitors combine a visit to Stonington with sightseeing in nearby Mystic and the Indian casinos. Water Street holds many boutiques, antiques shops, restaurants, and real estate offices. Beyond this commercial area is a residential one, ending in Cannon Square. The square is small, with two 18-pounder cannons used in repelling a naval attack mounted by four British ships with 158 guns on August 19, 1814, during the War of 1812. Forty Stonington buildings were wrecked, but the town defended itself admirably. The pretty square is surrounded by a neoclassical bank building, a fine old granite house, and several houses in Federal style. 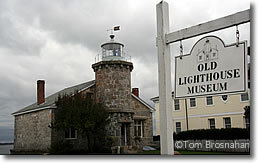 Beyond Cannon Square, continue south along Water Street to visit the Old Lighthouse Museum, at 7 Water Street (tel 860-535-1440), a fine old granite structure which was the first government lighthouse in Connecticut (1823). Inside are displays of maritime gear from the days of wooden whaling and fishing craft, swords, firearms (some made right here in Stonington), local stoneware, toys, decoys, and 19th-century portraits. There's a special room for children's exhibits. Stonington's first prosperity was from whaling, but in the age of steam it became a way-station on the route between Boston and New York City: trains from Boston brought passengers to Stonington, who then continued to New York City by steamship. When the railroad was completed for the entire distance between Boston and New York City, Stonington was no longer needed, a railroad viaduct cut off the town from the coastal highway, and the town fell into a neglect that probably helped to preserve it. Without wealth, there was no reason to tear down its fine old buildings and put up modern factories, warehouses and homes. The Old Lighthouse Museum, Stonington CT.